Lost in Translation turns 15 this month, giving us a welcome opportunity to celebrate what is a remarkable, underappreciated piece of cinema. Unfortunately released in the same year as what was possibly the most critically successful blockbuster of all time in The Lord of the Rings: The Return of the King, Lost in Translation went almost unnoticed at the Oscars of 2004, although writer/director Sofia Coppola did pick up a statue for Best Original Screenplay. Given that it is now considered by many to be among the greatest films of the decade, it can rightfully claim its place on the long list of masterpieces overlooked by the Academy. An archetypal character-driven drama, it is never too concerned with plot elaboration. Bob Harris (Bill Murray) is a world-weary actor visiting Tokyo to shoot a whiskey commercial. Charlotte (Scarlett Johansson) is the listless young wife of an upwardly mobile but inattentive photographer (Giovanni Ribisi), and spends her days moping around their shared hotel room while he works, listening to self-help audiobooks and generally feeling sorry for herself. We get some light-touch exposition on each of them before they eventually meet at the hotel bar. We spend the remainder watching their unlikely, enthralling relationship materialise. The themes of isolation and disillusionment with modern life are strikingly communicated. Bob wears his existential gloom with an aloof sense of humour; from Charlotte, we get a more direct sense of the despair that comes with her lack of purpose. They share their uncertainty about life in candid fashion only once, in a scene that fans of electronic music will recognise as the source material for the vocals on Fatima Yamaha’s classic slow burner, What’s a Girl to Do. Other than that, they allow themselves a break from disaffection: a limited period of joy in each other’s company. For us, it is achingly profound when compared with the lack of stimulation that we know awaits each of them once they part ways. Downtown Tokyo, in which almost all of this film takes place, proves a perfect setting for the development of the story. The overcrowded urban setting is an effective counterpoint to the gloom that lurks in both Bob and Charlotte’s lives, while also mirroring the childlike bliss they experience in the discovery of each other. Lance Acord’s cinematography fully unlocks this potential; the gaudy, colourful pulse of the city is beautifully captured, particularly in the sequence which follows their escape from a disgruntled bar owner through an arcade. Coppola offsets this sense of frenzy with the fleeting glimpses we get at quieter corners of Japan. Short, mostly wordless sequences, the best of which is Charlotte’s solitary wander through a shrine in Kyoto, are allowed to stand alone, dotted throughout the film without regard for plot progression. Their inclusion as visceral ornaments to the movie’s central flow is perfectly judged. Lost in Translation gives us what is arguably the performance of Bill Murray’s career. Known first and foremost for his work in comedy, he brings exquisite deadpan humour to the role of Bob. His early interaction with an overly enthusiastic call girl is the film’s funniest scene (and its brevity is testament to Coppola’s competence as a director; many others would have fallen into the trap of overblowing it). In this film, however, Murray also gives us something more. He lends the character of Bob a brooding air, a subtle melancholy that is reluctantly acknowledged but unquestionably present. It is almost impossible to imagine anyone else occupying the role so brilliantly. Johansson’s performance is not quite the tour de force that Murray’s is, but it is remarkable nonetheless. She was just 17 when playing the role of Charlotte, but commands the screen with the presence of someone much older. Charlotte’s mood flits from bored to gleeful to disconsolate, and Johansson gives life to all of these in magnetising fashion. It is little wonder that Lost in Translation was the beginning of such an illustrious career for her; according to Forbes, she was 2018’s highest paid actress. At 102 minutes, Lost in Translation is not an especially long film, and there is a definite sense of focus to it, without which it could easily have become a meandering affair. Coppola is careful not to bog us down with extraneous material; other than Murray and Johansson, the only real characters are Ribisi’s photographer and the impossibly vacuous movie star played by Anna Faris. The story line is bare almost to the point of non-existence. What we get in return for these sacrifices is a spectacular character exploration, and an unapologetic look at the trials of relationship dysfunction. In Lost in Translation, Sofia Coppola has given us the rare gift of a brutally honest work of fiction. Life, we are shown, is not a bed of roses, and the paths we choose early in life are far from guaranteed to lead where we wish. It is not a particularly happy film. It does, however, carry with it a positive message, one that tells us that there are glimmers of joy and beauty to be found in life, perhaps where we least expect them. 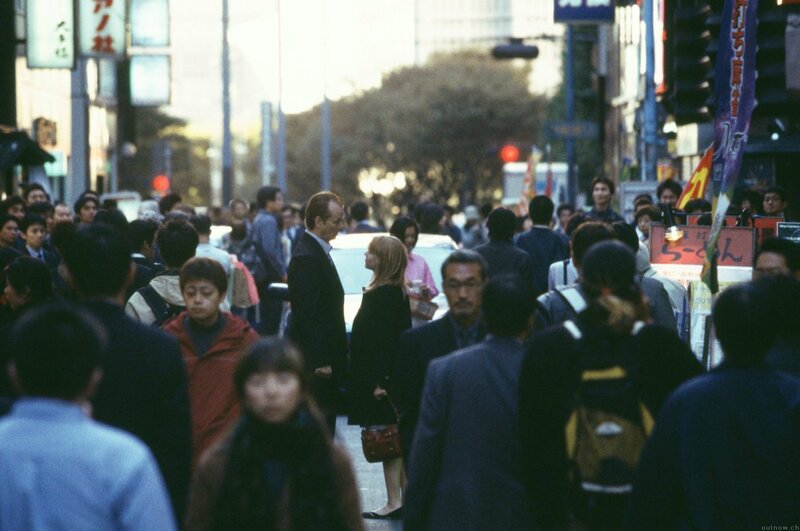 “Everyone wants to be found,” as the theatrical release poster says, and Lost in Translation shows us just how captivating an experience being found can be. What are your thoughts on Lost in Translation? Underappreciated gem or nothing more than navel gazing? Let us know in the comments below. 15 years old! Blimey. I think it’s a classic, love it… but sadly I haven’t revisited it for years… going to rectify that asap.